At the end of last year, Bebe Cool together with his Gagamel Crew advertised the coming of Chaka Demus and Pliers massively to usher in the new year. In the end, Pliers and Mr.G of the Swaggerific fame plus several local artistes together with Bebe Cool put up a splendid show. The Jamaican stars had attracted hundreds of fans to Speke Resort Munyonyo that is owned by property mogul Sudhir Ruparelia, but on realizing that of the Chaka Demus and Pliers singers, only Pliers had turned up, all hell broke loose. Some of these fans had just been duped earlier on by the organisers of Oneil Bryan aka Elephant Man who did not perform on his own show, so they became violent and resorted to damaging property that included lights, pavements and washrooms to cover up for what they termed as a 'loss'. 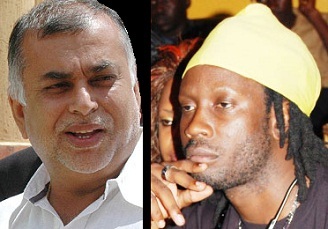 Sudhir now wants the 'Minzani' star to cough the dime that is estimated at Ugx40m in damages..Watch this space!